Custom built "in house", our test bench allows us to ship repaired or remanufacted pumps, motors, valves and cylinders with the assurances that they will perform without failure. 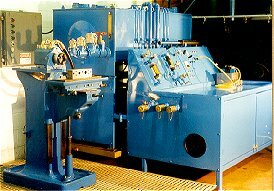 We test pump flow & pressure, hydraulic motor load & performance, valve performance & spool leakage, cylinder repairs and seals. We must be sure you will be 100% satisfied. Brantford Hydraulics' lapping table can attain a "micro" flat finish on critical pump and motor components. This service allows us to complete necessary repairs under our own control for rapid turn-around. Piston pump valve plates, cylinder blocks, piston shoes, swash plates, vane flex plates, vane rotors e.t.c., can all be refinished for a quick return to service. They are refinished or replaced from stock. If you require a part, a component, remanufacture or repair of your own, we can provide you with a quote at very competative prices. Just email, fax or call us through our "contact us" page. Custom, made to order hose assemblies. Parker's one piece crimp-on end is guaranteed to produce a hose that can last. We have the capabilities to assemble and crimp many hose types from 1/8" plastic to 2" SAE100R13 or "Six-Wire". We stock all popular hose ends JIC, NPT, ORB, ORS, JIS, BSPP, SAE Code 61 and 62. Not only do we have the fittings but we have the hose, SAE100R1, R2, R4, R5, R7, R9, R12, R13 are some of the types of hose we stock. © Copyright 1992 - 2019 Brantford Hydraulics Inc. All rights reserved.